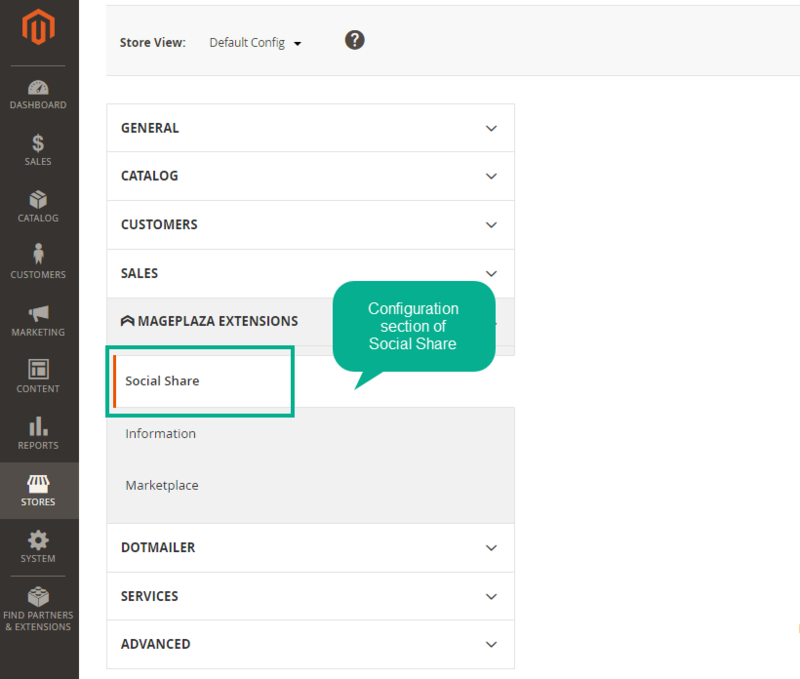 Social Share for Magento 2 is proper solution to public customers’ sharing experience to multiple social channels. This is an excellent method to promote store brand, increase traffic and improve site ranking effectively. The social sharing from others such as friends, family or colleagues will bring more trust on a page or a product. Besides, people tend to feel more curious and concerned about the shared item rather than the new one they actively find out. Integrating social sharing buttons right on sites supports customers to share their good experience about a page or a product easily and conveniently. As a result, this will enhance customer experience during shopping significantly. The number of turns sharing content from social share buttons is a useful channel to promote store brand and target store products to new prospective customers quickly and economically. Therefore, providing sharing buttons creates a great opportunity to reach out to and gain new customers. When the posts are displayed in front of social media will urge viewers to click on and find out more. As a result, this way will create a boost in traffic to store site effectively from multiple social channels. Direct links from store site to the social channels actually helps increase the chance that users can find a website more easily when they search on Google, Bing and other searching engines. Easy to share on unlimited social channels Social Share extension allows placing unlimited sharing buttons from various social channels on the shopping sites easily. The main channels which are the most popular currently such as Facebook, Twitter, Google+, LinkedIn will be easily displayed vividly on Home Page, Category Page and Product Page. Let your customers market your products These powerful sharing buttons will shortly draw customers’ attention and raise their excitement to share their exciting moments with friends in various social channels. For example, a customer who is concerned about a T-shirt on Product Page, he/she can quickly share this favoured product to the friends via their Facebook. As a results, the shopping site is likely to reach out to many new potential customers. The position of sharing buttons should be concerned so as to catch customers’ eye easily. 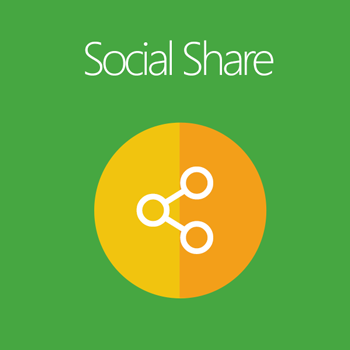 Social Share extension supports stores with 2 Inline styles and 2 Floating styles to make sure that customers can interact with the social channels conveniently. With Floating types, these sharing buttons will be selected to display to the left or right of the page margin horizontally or vertically. 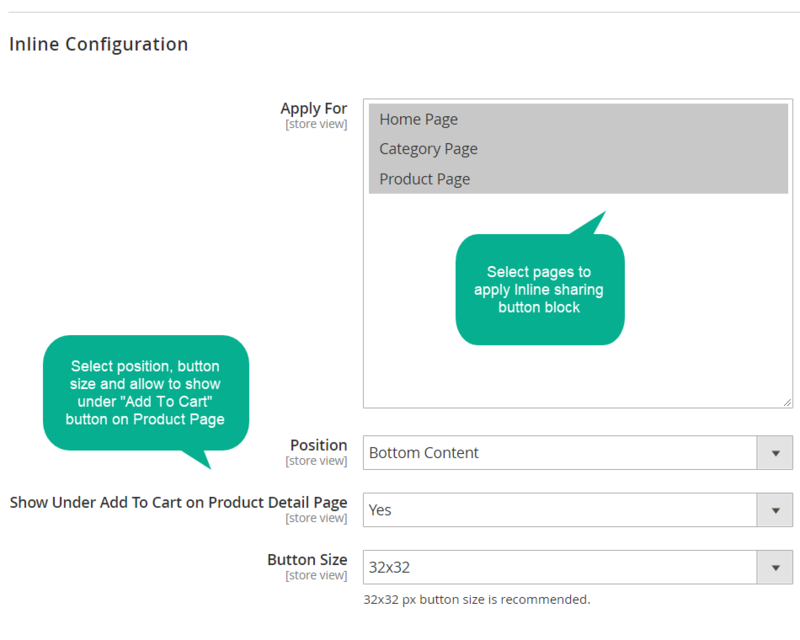 Meanwhile, Inline types allow placing these buttons on the top or bottom of the content, or under Add-to-Cart button. Customizable sharing buttons Drawing more customers’ attention by eye-catching sharing buttons! 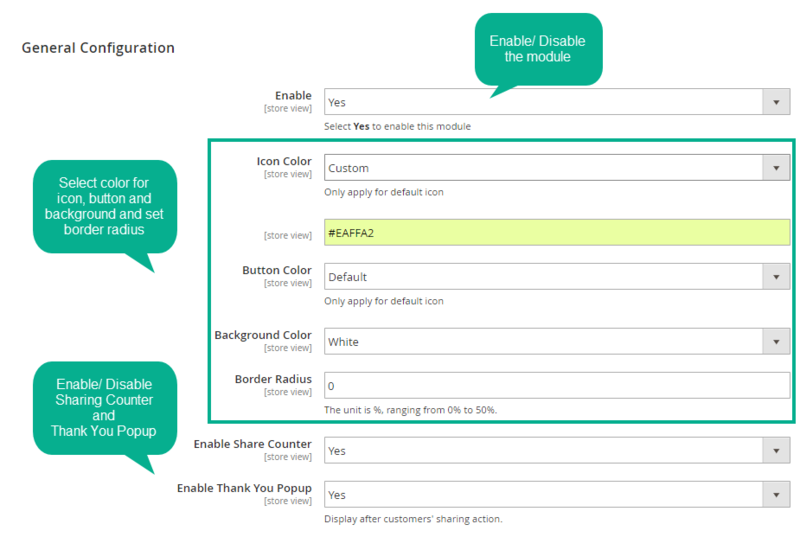 Social Shares assists admins to design button size, icon color, button color, background color and border radius with ease. Easy to upload your own sharing button icon Besides, admins can easily upload the images to make icons for sharing button. Therefore, the appearance of sharing buttons can be properly customized to match well with store themes and look much more impressive and attractive. 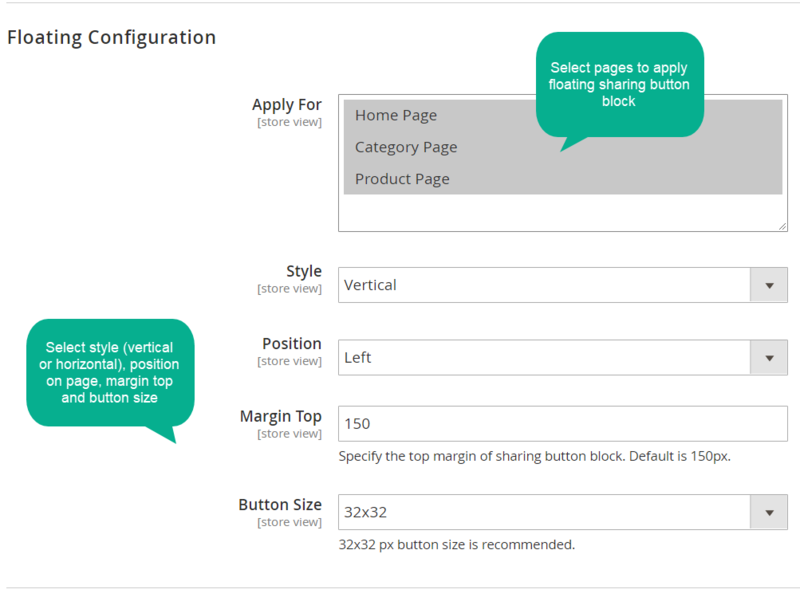 Sharing buttons can be embedded to any pages and any positions on sites. Three snippet types are supported including widget, block and PHP code. 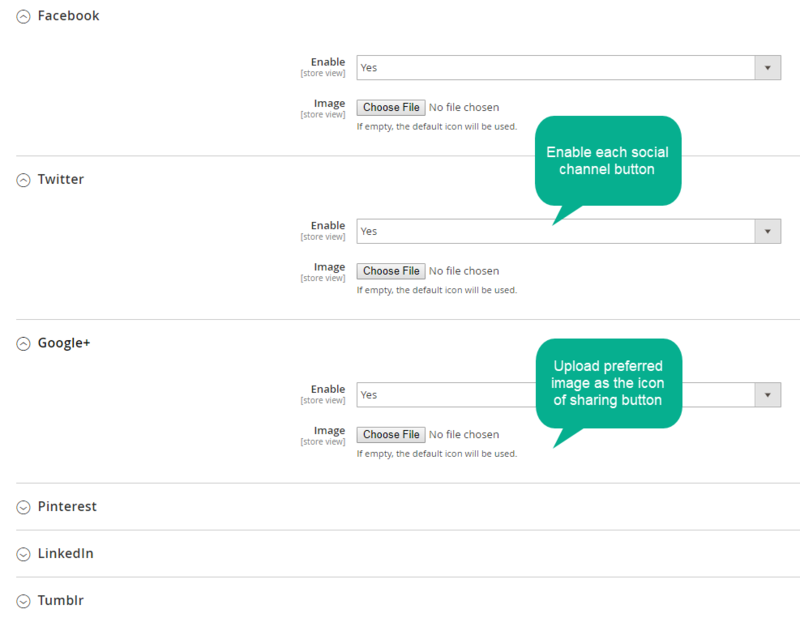 This will help admins flexibly place sharing buttons according to their purposes. Display the thank-you message after customers’ sharing. Be well responsive with mobiles, desktop, tablets, and other screen sizes. Share favourite pages or favored products quickly during on shopping site. Be more trusted on products thanks to the other ’s social sharing. Easy to know recommended shopping pages/ items via social channels. filter_drama Which position on a page can I place the sharing button block? With Floating type, you can place it on the left or on the right of the page. With Inline type, the icon will display on the top/ at the bottom of page content. filter_drama How can I design the appearance of sharing button? filter_drama How can I know the number of shares? 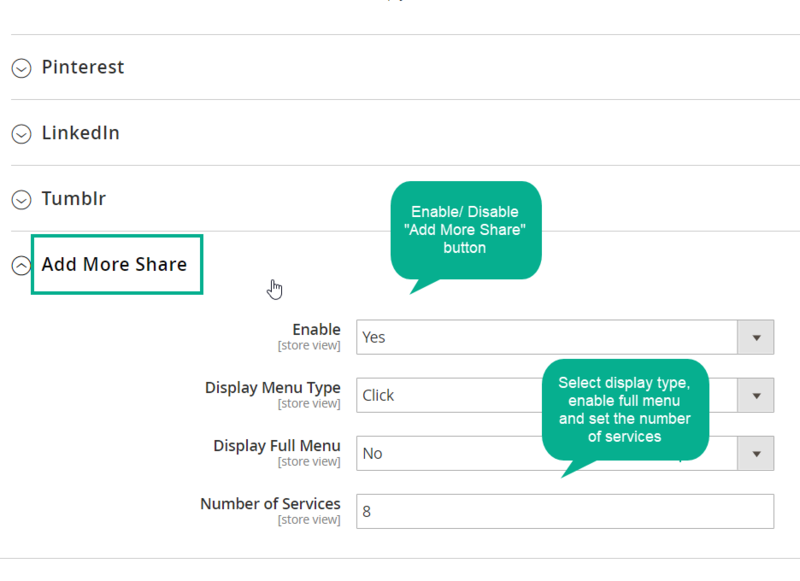 You only need to enable the share counter from admin backend. The number of shares will appear. filter_drama I would like a thank you or success message appearing after a customer shares a link? You only need to enable Thank-you popup from the admin backend. A thank-you popup will appear instantly after a customer clicks on the share button. filter_drama How many sharing button can be placed on the page? It is not limited at all. The button “+” is supported to allow displaying a list of up to 230 services. Highly recommend! Very good quality for both extension and support! This extension work great, easy to install and configure, and the configuration is very useful. Thank you Mageplaza Team, all works fine. This is a very great free extension. All works fine. And the configuration is very useful. Very good quality for both extension and good support.